Rinaldo, an associate professor of Art & Technology at The Ohio State University, has achieved international acclaim for his interactive robotic sculptures and installations. 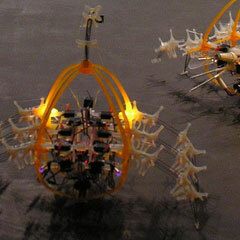 The Autotelematic Spider Bots are 5 spider-like sculptures that interact with the public in real-time and self-modify their behaviors based on their interaction with the viewer, themselves and their environment. They "see" with long-distance ultrasonic eyes and shorter distance infrared eyes. They twitter like birds or crickets and have a flexible and expressive neck that rocks back and forth. They were modeled in 3D software and output in flexible rapid prototyping plastics and define a new morphology for a hexapod robot never before attempted. They have been exhibited in England as well as the United States. In Machinic Drift, a variety of works will be presented including: 3D imaging works entitled the Machinic Diatoms; Augmented Fish Reality, an interactive installation of rolling robotic fish-bowl sculptures, and Our Daily Dread, an interactive work concerned with the mechanization of food production as we reach critical stages of overwhelming the planet's ability to feed the world's population.